However, this isn't the first time that someone has tried to add a touchscreen in place of the trackpad. Acer floated the idea with its Aspire Ethos laptops, while Razer experimented with this on its first Razer Blade back in 2011. 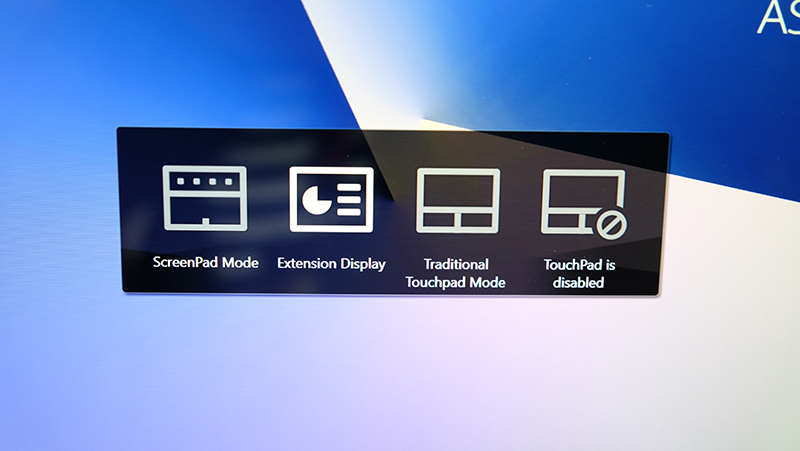 The ScreenPad, as ASUS calls it, can act as a regular touchpad, a secondary display, or even an extended desktop. 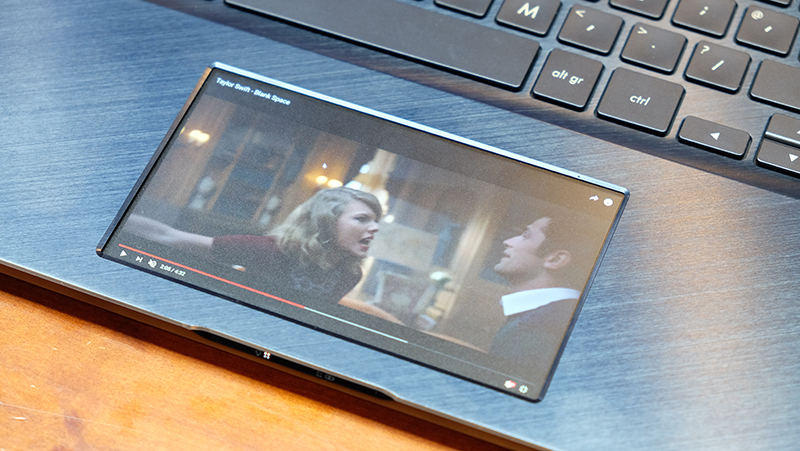 The latter lets you drag a browser window off the main display and onto the ScreenPad, so you can actually watch a YouTube video on it (although I’m not sure why anyone would want to). It also provides contextual controls for things like YouTube and Spotify, and it acts as a function command screen for Microsoft Office programs like Word, Excel, and PowerPoint. In addition, it can mirror a smartphone on your PC using the ASUS Sync app. You’ll also be able access app shortcuts and launch programs directly from the ScreenPad, which can be quite convenient. Some of its most useful features are also the simplest, and you can use it to view your calendar and call up the calculator or number pad. It uses a 5.5-inch 1,920 x 1,080-pixel IPS display, and you can switch between the various modes using F6. 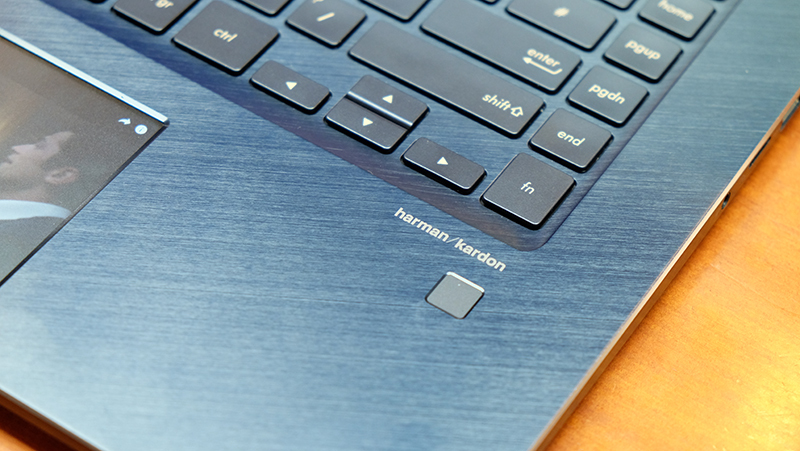 The trackpad is also actually topped with glass, but it features a matte finish to ward off fingerprints. Videos don't look too great through this finish, so it probably isn't going to be what you use the display for most of the time. That said, it’s difficult not to draw comparisons with the MacBook Pro’s Touch Bar, and it does seem like a slightly better implementation at first glance. For one, it doesn’t remove any important physical buttons like the Escape or function row keys. Instead, it sits where the trackpad usually does, so you don’t have to get used to any changes in layout. Nevertheless, the secondary display can come across as a little gimmicky, even if it appears well implemented. It’s not entirely clear why anyone needs this, but it’s a neat twist that could potentially become quite useful if enough developers add support for it. 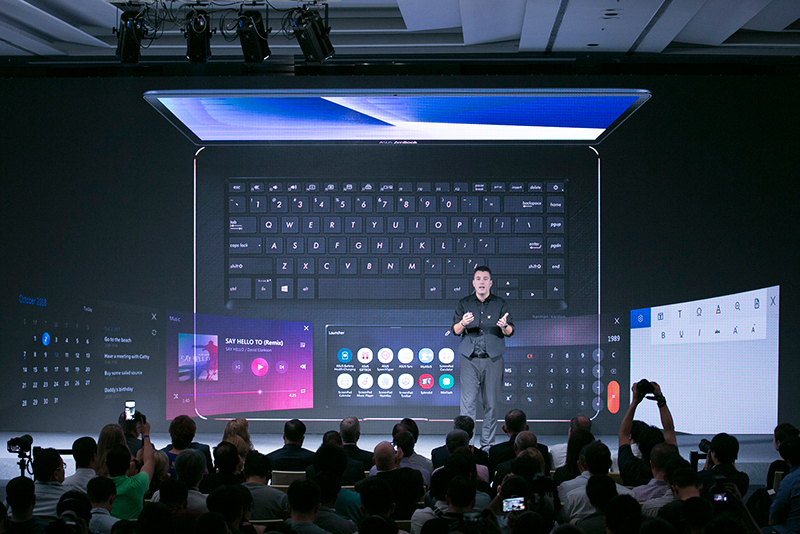 ASUS says it’s making the ScreenPad SDK public, so anyone will be able to create new apps to take advantage of it. The company will also maintain a website where all the compatible apps are listed, most of which will be available via the Windows Store. However, given the Windows Store’s lack of popularity, it’s not clear how well this will work out. The ZenBook Pro 15 was designed with three kinds of professionals in mind – video producers, photographers, and 3D designers. To that end, the ScreenPad is backed up by a set of very solid hardware. One of the most important aspects of a notebook for creative professionals is probably the display, and the ZenBook Pro 15 offers up to a 15.6-inch 4K touchscreen NanoEdge display with a Delta E value of less than 2, which should translate into excellent color accuracy. Furthermore, it covers 100 per cent of the Adobe RGB color space and has also been Pantone-validated for color accuracy. On top of that, the laptop can output to five external displays at once, thanks to its two Thunderbolt 3 ports that support two 4K displays each, and one full-sized HDMI 1.4 output. 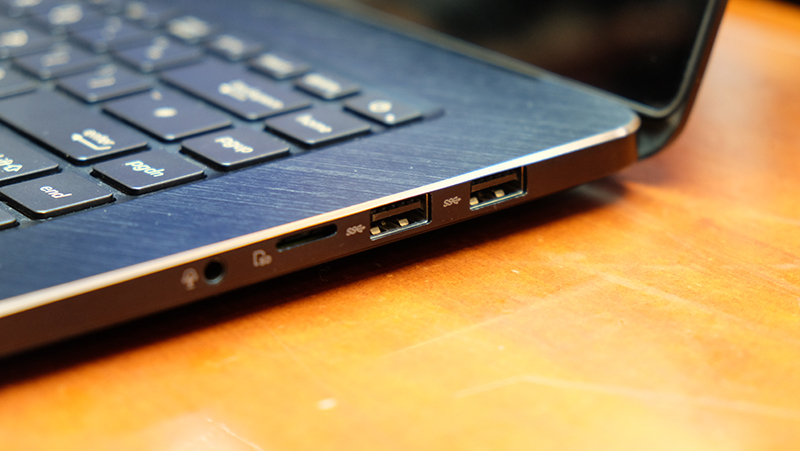 You’ll also find a further two USB 3.1 (Gen 2) Type-A connectors on board and a microSD card reader. This should be enough for most folks, but it’d have been nice to see a full-sized SD card reader, especially considering the laptop’s target audience. 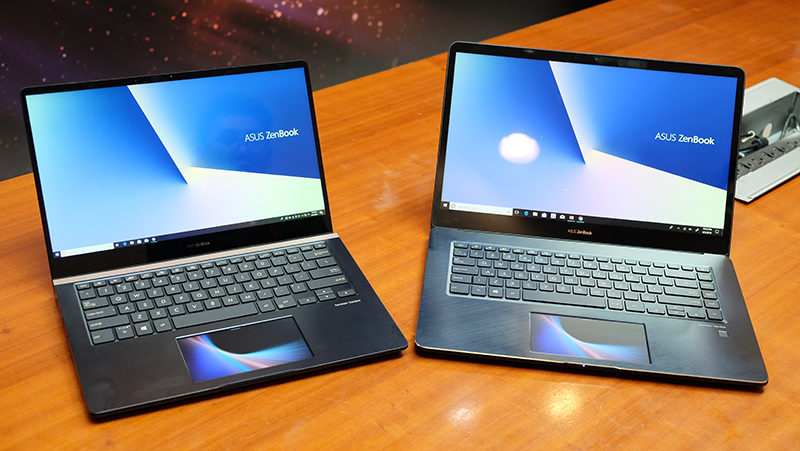 However, while the previous ZenBook Pro featured a quad speaker setup, the new model utilizes dual speakers, partly because the ScreenPad demanded a rejigging of the internal layout of the notebook. That said, the resulting audio quality is by no means a downgrade, and the Harman/Kardon-certified pump out loud and full-bodied sound. 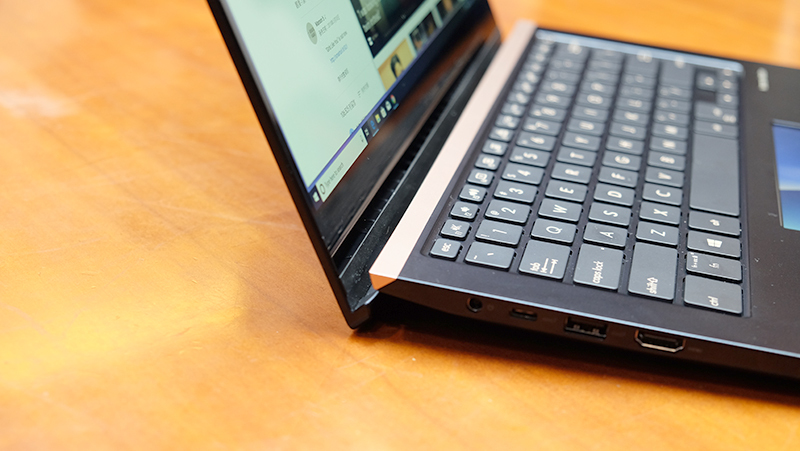 Thanks to its thinner bezels, the ZenBook Pro 15 is around 2.33cm shorter than its predecessor and occupies a smaller space footprint. At 1.88kg, it also feels quite sprightly for a 15.6-inch notebook. To keep things cool, the laptop relies on dual fans and three heat pipes to channel heat away from the CPU and GPU. The third heat pipe is actually integrated into the rear of the PCB, so you won't see it even if you open up the laptop. The all-metal unibody construction also conveys a sense of quality, and this feels like a very well-built laptop. 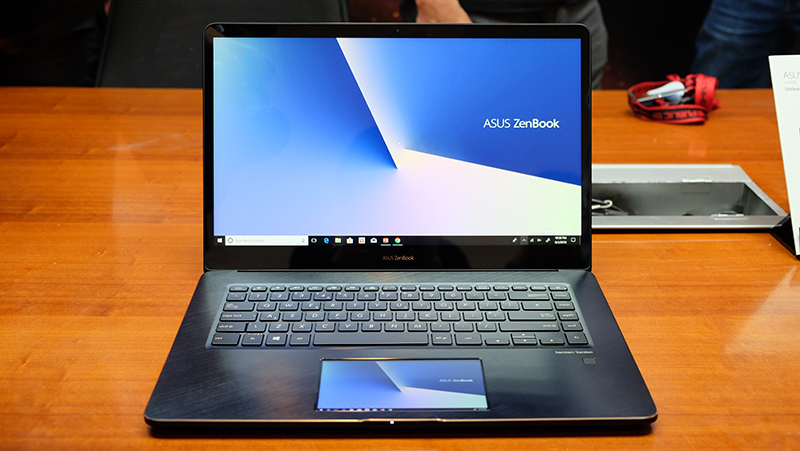 The smaller ZenBook Pro 14 shares a similar aesthetic, but it uses ASUS’ ErgoLift hinge, which automatically lifts the keyboard into a more comfortable position when the lid is lifted. 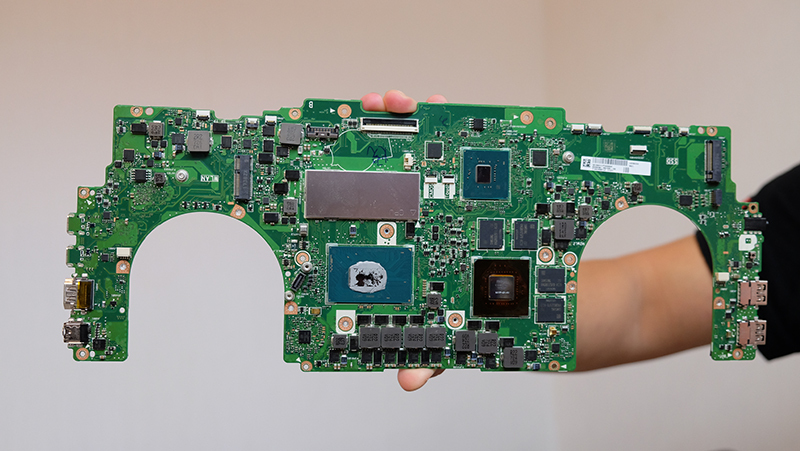 However, the 14-incher is less powerful than its larger sibling, and it can only be equipped with up to a Core i7 processor and an NVIDIA GeForce GTX 1050 Max-Q. 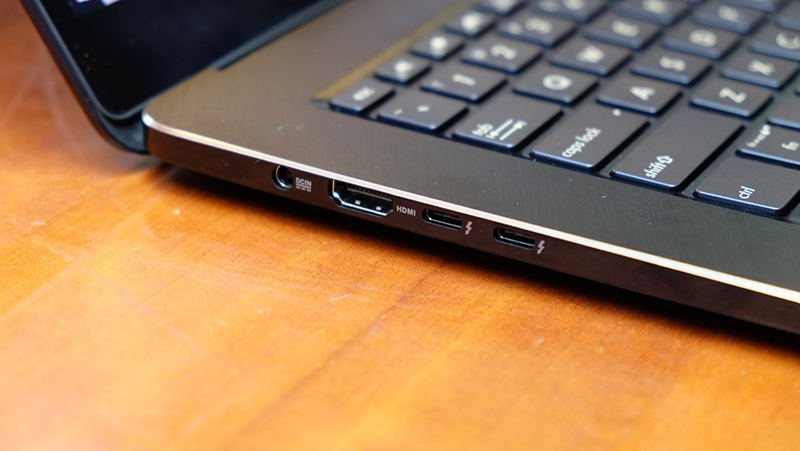 Its lone USB-C port also doesn’t support Thunderbolt 3. The ZenBook Pro 15 will go on sale in July at S$3,998. The ZenBook Pro 14 will arrive later this year.